I’ve partnered with Component Playgrounds to bring you this post. We just installed a new swing set in our back yard last week. 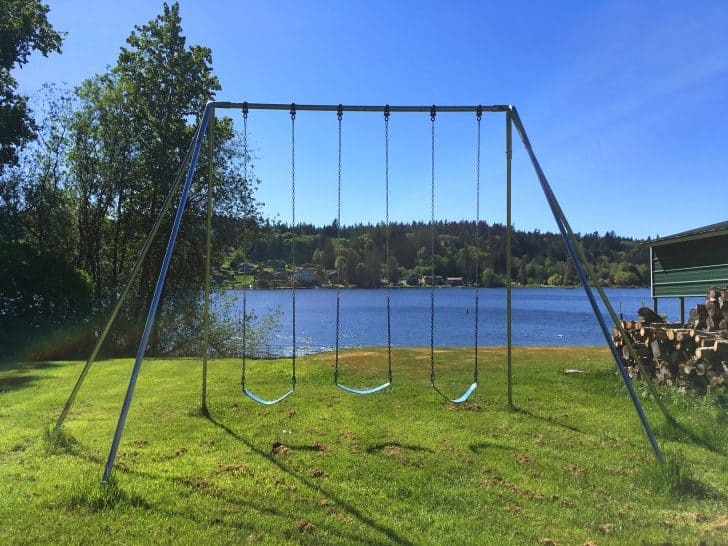 For those of you considering a swing set we want to share with you the brand that we feel offers the best quality and value for the money: Component Playgrounds. If there’s one thing you know about how we choose products in our family, it’s that we always carefully research them and go with the one that lasts. Quality is our main objective because it saves you money in the long run (you don’t have to replace it over and over). Component Playgrounds has been committed to providing the highest quality swing sets and backyard playground equipment available since 1984. 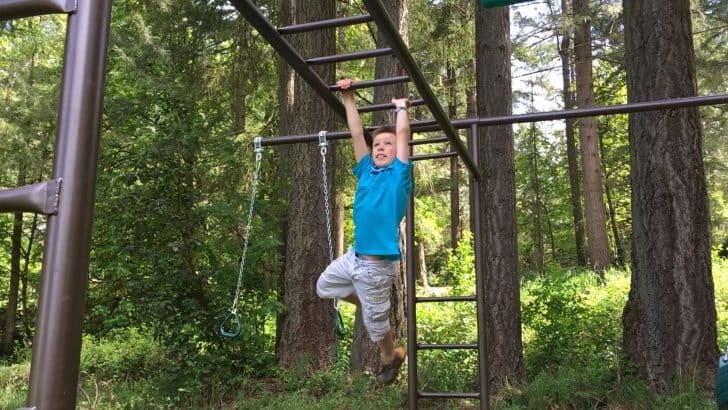 Their play set options include swing sets, slides, monkey bars, climbers, fitness equipment, teeter totters, playhouses and clubhouses. They also carry trampolines, benches, picnic tables, bike racks and sports equipment. First rate design, attention to details, and heavy duty materials make our playground equipment the first and best choice of parents nationwide. 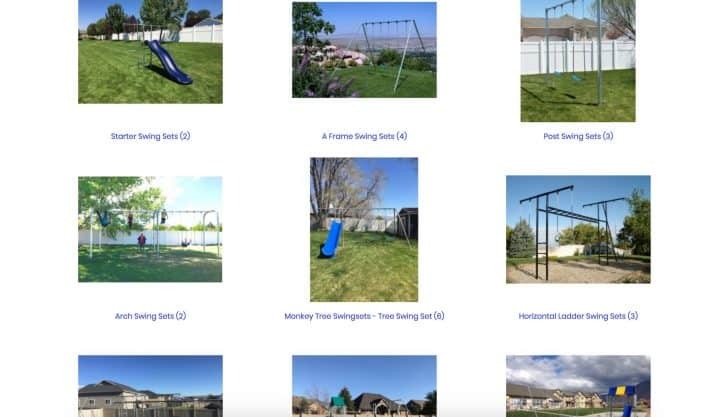 Component Playgrounds is based in Salt Lake City, Utah and their swingsets are 100% Made in the USA from the highest quality heavy gauge, commercial-grade galvanized steel. Designed for commercial and residential use and for both children and adults, you’ll find Component Playgrounds play sets in school and public parks, in gymnasiums and in private residential settings. A leader in the industry, Component Playgrounds is committed to building the best and most durable playground equipment on the market. 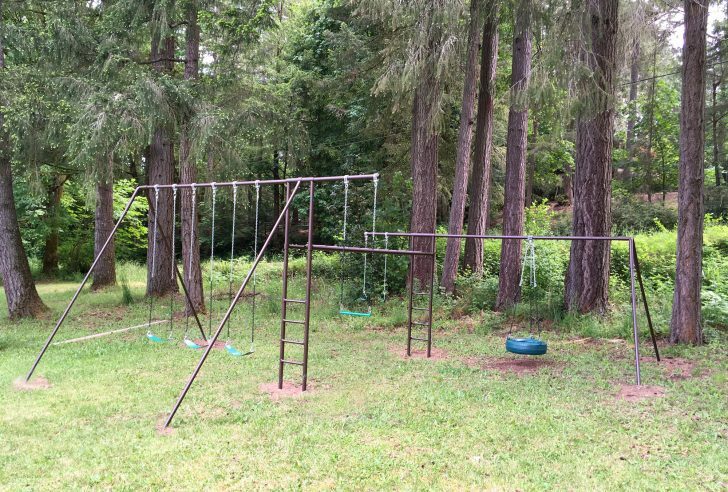 Each individual swing on every metal swing set they sell is rated to hold more than 500 pounds! Their swing sets and playground equipment meet or exceed current safety standards. A really neat feature of Component Playgrounds’ play sets is that you can customize your play set with a variety of fun options. And you can also add other components to your play set down the road. You have the option of expanding your playground as your needs grow and change. Component Playgrounds gives you the freedom to change or add to your play set. For example, you can start small and add to the structure over time, making it even larger or changing the features. 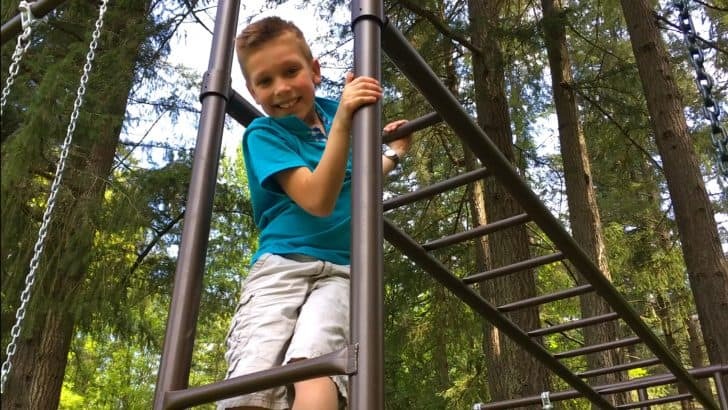 Parents and grandparents have been buying Component Playground play sets for nearly 35 years because of their high quality and reasonable prices. And with over 40 different models they’re selection is terrific. They also offer free shipping on the swing sets and have special sales throughout the year where customers can save hundreds of dollars off select models. If you want to know the quality of the swing set, look at the warranty. If the manufacturer is proud of their product quality and workmanship, they will offer a sound warranty. Component Playgrounds warranties the structure of your swing set to be free from defects in materials and workmanship for as long as you own it! It is easy for us to offer a warranty this good, because we know that our products are that good! I should add that Component Playgrounds is an accredited member of the Better Business Bureau and has a perfect A+ rating. Also, their customer service is excellent. When you call the phone will be answered by a real person who speaks fluent English and the staff is very friendly, professional, knowledgable and they stand ready to help. 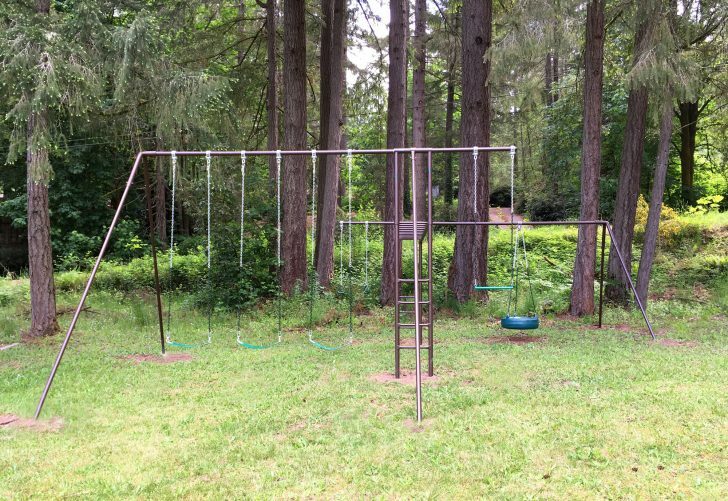 In terms of upkeep, Component Playgrounds backyard swing sets and backyard playground structures are constructed of heavy galvanized steel and require little or no maintenance. The standard sets come in heavy, unpainted galvanized steel which doesn’t rust. They also have the option to get a powder coating in a variety of colors. We wanted our swing set to blend in with the forested setting of our back yard and so we chose cappuccino. It fits the setting perfectly and we LOVE the way it looks! Here’s a fun fact I came across. From the Guinness World Book of Records: “The longest swinging marathon by an individual is 30 hours by Amanda Gowans (USA) at Component Playgrounds, Salt Lake City, Utah, USA, from 27-28 May, 2005.” Yes, she won the record on a Component Playgrounds swing set and covered the equivalent of 180 miles! That record was later beat by just 2 hours 7 years later in New Zealand. 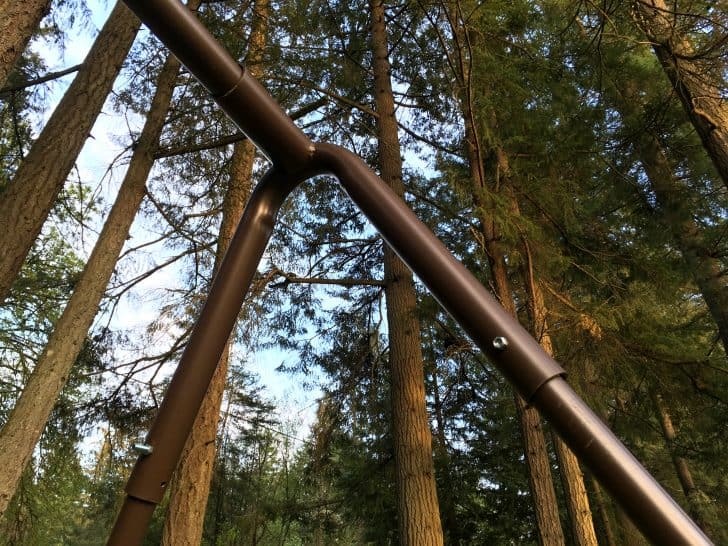 We were originally introduced to Component Playgrounds when we visited a friend’s house who had recently installed one of their swing sets, the A-Frame Swing Set (AF30). After a few minutes of swinging we were hooked line and sinker. 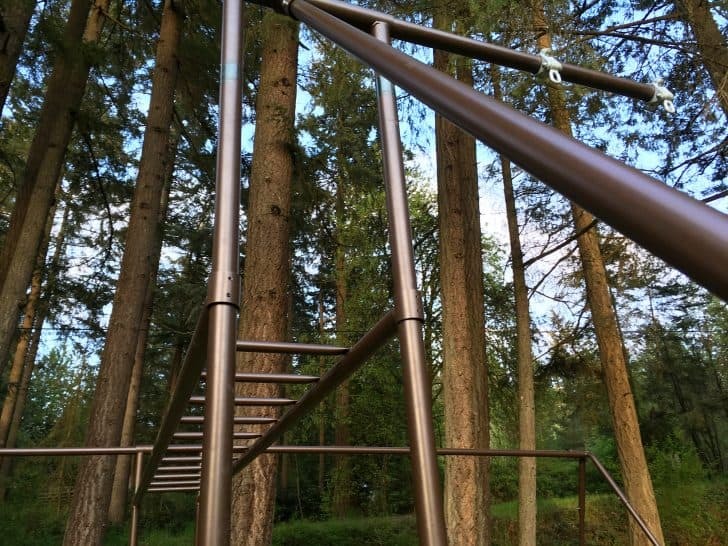 If you’ve ever soared on a 12 foot tall swing (and I mean you feel like you’re flying! ), you know what I mean. And we were so impressed by the heavy-duty build quality of this swing set. 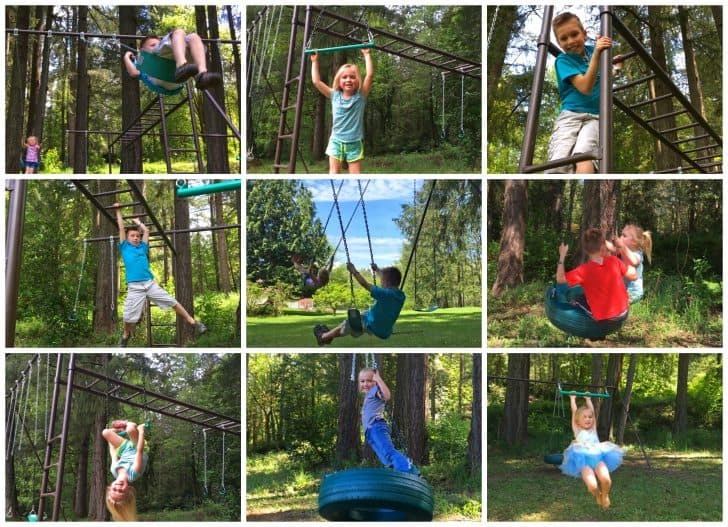 It didn’t surprise me to later learn that it’s Component Playgrounds’ most popular swing set. 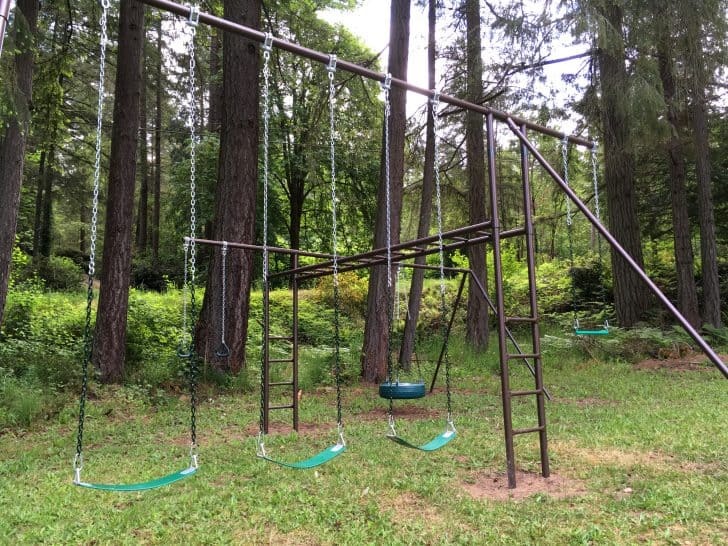 Trust me, if you’re in the market for a swing set only, THIS is the one to get! As much as we loved the 12 foot swings, we wanted to get a swing set that had a few more options for our growing children and their friends, so we chose the Super Swing Set (SS47), which still comes with an impressive 10 foot tall option (standard playground sets are 8 feet) for a very minimal charge. And trust me, you’ll still feel like you’re flying! Our swing set is large enough to keep at least 8 people entertained at a time at the various stations and our kids and their friends have been having a blast with their our new swing set. Built for both children and adults, this will last them for many years to come and will later provide endless fun for our future grandchildren. How Difficult Is The Assembly & Installation? We’re glad you asked! That was our initial question as well. We were told we’d need 3-4 people and that it would take 5-6 hours. We used 3 people including myself and it took us half a day to get it set up not including the cement. We faced the added challenge of working on a slope so that added some extra time. Had it not been for that we would have had it assembled within the estimated time frame. But the assembly is by no means difficult. There aren’t a lot of parts and the process for setting it up is pretty straightforward. 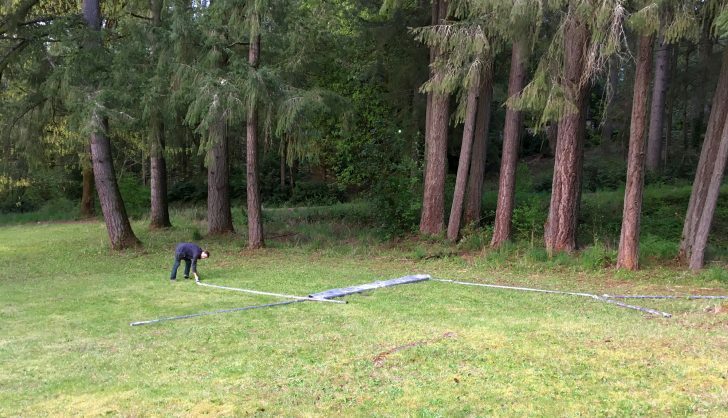 We definitely recommend setting it up on as level of ground as possible because that will save you some time and headache. We were extremely careful in our choice of brands for our backyard swing set. We wanted the best, the strongest, the tallest, the safest and the longest-lasting. We found what we were looking for at Component Playgrounds. They have our complete vote of confidence and our highest praise. We recommend them without reservation. To learn more and to choose the right swing set for your family, visit Component Playgrounds. I’ve partnered with Component Playgrounds to bring you this review. As always all opinions are entirely my own and I only publish positive reviews of products and services that our family personally trusts. This looks so good and sturdy! Love the color choice! Perfect timing! We just moved and are looking for a new set for our kids. 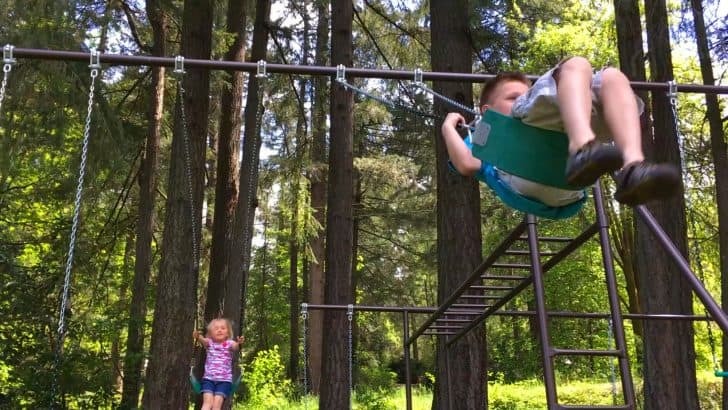 This swing set looks awesome! Love that it’s so durable! 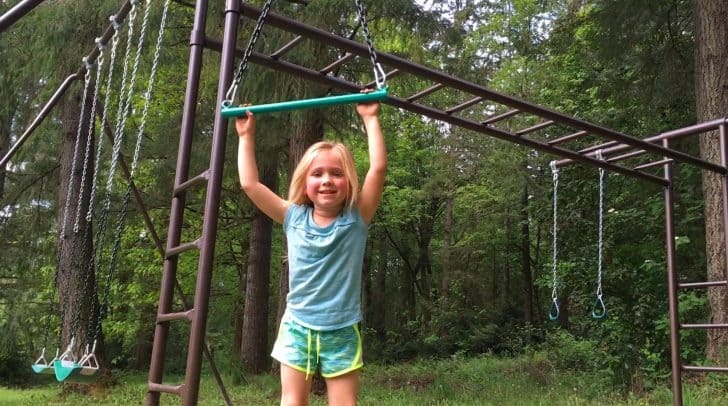 Thanks for sharing about this swing set! Looks like they have a great selection available! This swing set looks so great! How fun! 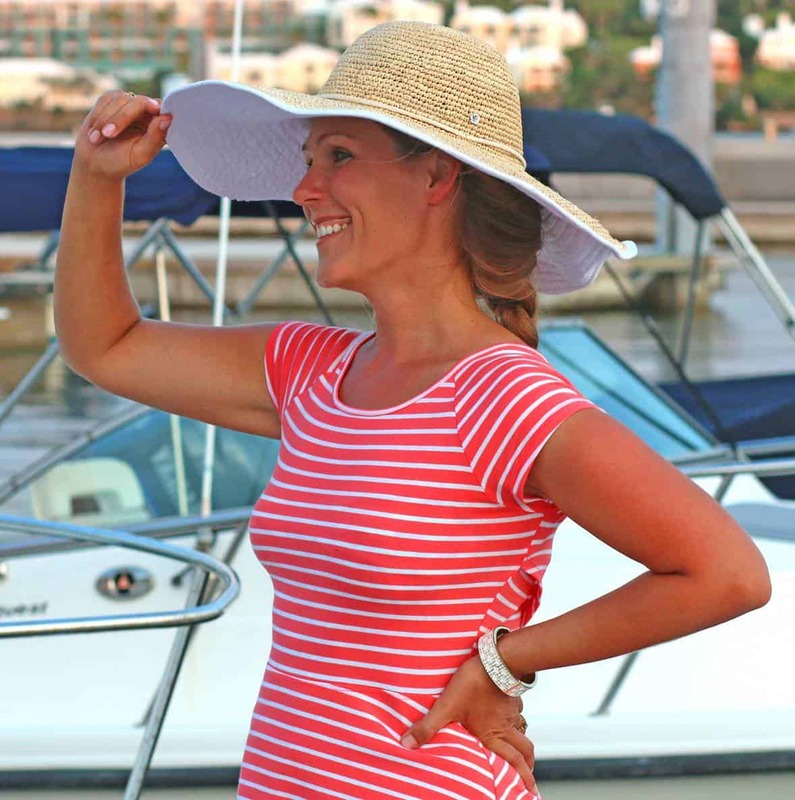 The kids are going to have so much fun this Summer with that! What a cool setup! I need to check out this company! Oh my gosh! My boys would absolutely love this! Very impressive! Will definitely keep this company in mind, thanks for sharing this review! This looks like such a well constructed set! I want to play on it!! I always wanted one of these as a kid! How cool! My kids would love this! Looks like your kids approve! What a beautiful family you have. What a stunning swing set! And I can’t think of any more perfect to showcase it than those completely adorable children of yours, beautiful family :) That’s awesome that it’s 10 feet high, that really makes a difference. You’ve given me much to think about, thanks for another great review, Kimberly. My would son definitely love these swing sets! I really need one of these in our backyard and I’m not sure who would get more use out of it, me or my grandkids! :) Great review, really loved the video! You guys are amazing (and your kids are SO adorable!) and this swing set is gorgeous, I want one! Thanks for this review and info.